I know I struggled with POVs when I first started writing. 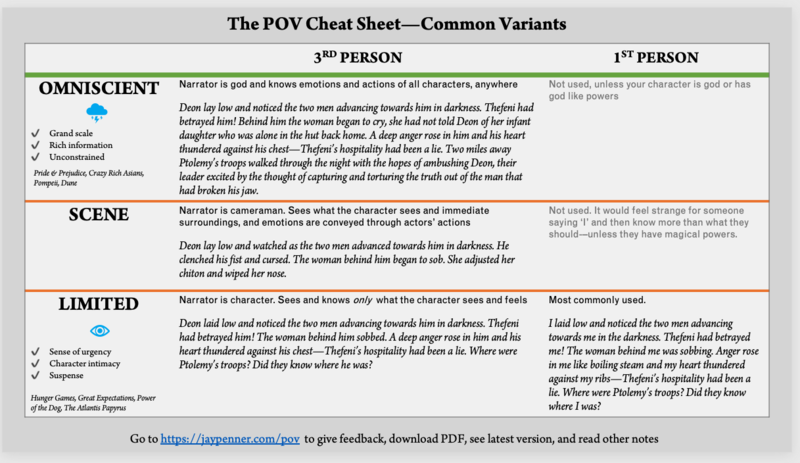 Not that I have it perfect, but when I began I had no clue at all on how to think about character POVs in fiction. I've put together what I hope is a simple graphic on common POV formats and I hope you find it useful. Very open to suggestions, corrections, and improvement ideas. I'd ideally like to keep it to a single page. Edit 1: Guess Harry Potter isn't 3rd Person Omniscient, I'll fix it. Edit 2: Made some fixes to the sheet based on comments below. You can get the PDF here, I will keep it updated time to time. How could I manage to do this POV? Read: Rewriting fanfiction into "publishable" material? Next articleStory is told through eyes of protagonist (3rd person limited), but narrator adds info. along the way.